House painters prepare surfaces and apply paint, stain, varnish, wallpaper and other finishes to protect and maintain interior and exterior surfaces of buildings. Read work orders or receive instructions from clients to determine work requirements (e.g. materials). Estimate costs, based on surface measurements and work orders. Erect scaffolding, supports, ladders, etc. to work above ground level. Clear the surface, remove obstructing fixtures (e.g. lamps, electric switch covers) and protect other surfaces with dustsheets, plastic sheets, etc. Prepare surfaces using different techniques (e.g. burning, sanding, scraping, sandblasting) and by treating with preparations (e.g. turpentine, mildew remover). Fill cracks, holes and joints with caulk, putty, plaster or other fillers, for instance using caulking guns or putty knives. Apply a primer or sealer to prepare the surface for the finish coat. Mix paint, stain or varnish with oil, turpentine or other additives to obtain desired colors and consistencies. 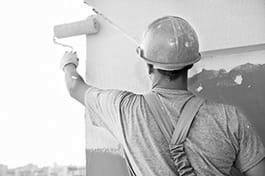 Apply paint, stain, varnish, wallpaper and other finishes to walls, ceilings and other surfaces inside or outside the building using different techniques and equipment, such as brushes, spray guns or rollers.